China is a valuable remedy in the treatment of malaria. The fever may be either tertian (fever which comes once in 48 hours) or quartan (coming every 4th day) or quotidian (coming daily). It may begin at any time of the day, but never at night. There are three stages in fever, viz., chill, heat and sweat. Chill may be absent, but the fever and perspiration must be present. Chill: Chill comes generally in the forenoon. Chill over the whole body and short duration. Thirst before and after but not during chill. Heat: This stage is long lasting, usually without thirst or he wants only to wet his mouth. He uncovers frequently but has to cover again due to a sensation of chill. Sweat: Profuse debilitating sweat. Great thirst during sweat. Sweat does not give any relief to the patient. The apyrexia (the period between two attacks of malaria) is marked with debility, restlessness, loss of appetite or great hunger, anemia, congestions, backache, oedema, scanty urine with brick-dust sediment soreness in liver and spleen. Ars. is one of the most important remedies and next to China and is more frequently indicated than any other remedy. The characteristic of Ars. in malarial fever are intensity and long duration of heat, unquenchable thirst for hot drinks, anxiety and restlessness and clean tongue. Not thirst or very little thirst during chill. He drinks large quantities at a time. Sometimes drinks little at a time, vomiting each time after drinking. The next stage is the stage of sweat. The sweat is cold, clammy and prostrating. Thirst continues, but the peculiarity of thirst is that he drinks large quantities at a time or small quantities at a time. N.V. is also being a very important remedy in malaria. It is useful for all types but especially for tertian (which comes once is 48 hours) when the attacks occur in the morning. There is constant chillness is most striking characteristic of N. V.
The patient feels chilly in all the stages and at all the times. Chill starts with blueness of the finger-nails, preceded by aching of the body, gaping and yawning. Even during the heat stage when he is burning all over, he feels chilly on the least uncovering. Another very important feature about the onset of the N. V. is that fever comes a few hours earlier every day. Thirst before, during chill and during fever. Thirst disappear during the stage of sweat. Taste of mouth is bitter. Tongue is coated yellow or white. Loss of appetite, dull frontal headache, nausea, vertigo, soreness of liver, constipation and weakness are ever present. Chill begins in small of back from 7 to 9 a.m. Severe thirst, several hours before the chill. Patient knows of the approaching fever from insatiable thirst and the bone pains that come on long before the chill sets in. Thirst continues during chill and fever. Thirst disappears during the stage of sweat. Great soreness and aching of bones during fever. Vomiting of bile at the close of chill or fever. Intense aching and soreness in back and limbs. In some cases, there is double periodicity- the chill comes in the morning one day and in the evening of the next. It is indicated when—chill without thirst. Chili running up and down the back. Sweat moderate or profuse, but relieving pains. Drowsiness, dizziness and dullness are characteristic symptoms of gelsemium. 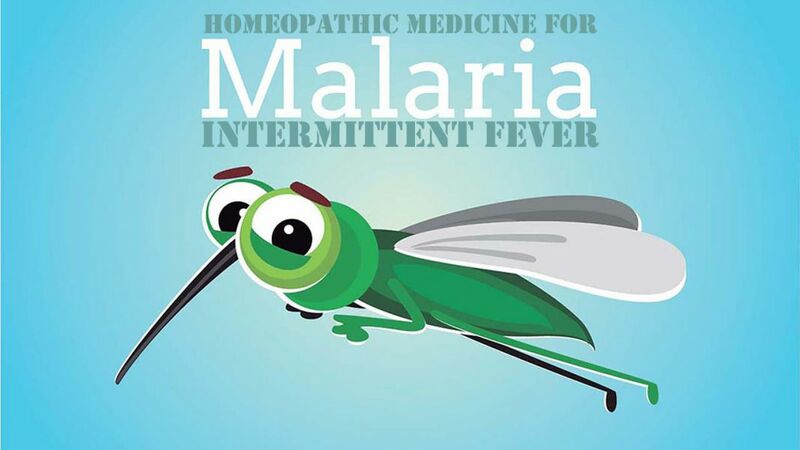 A valuable remedy in malaria. Chill between 10 and 11 a.m. and begins in the small of back or in the feet. Thirst, aching pains all over the body and throbbing headache during chill. The fever is usually violent. Thirst during fever. Drinks large quantities and often. Vomiting of bile between chill and fever or during fever. At times the headache is so severe that the patient becomes delirious or unconscious. By and by profuse sweat breaks out and it relieves the headache and all other symptoms. It is indicated when the chill begins in thigh and is attended a dry, teasing cough. Hours before chill dry, teasing, fatiguing cough, continuing during the chill. Shaking chill even in warm room. Chill better by covering up. High fever, as if dashed with hot water. Urticaria over entire body, itching violently, which passes of with the sweat. Restless, changing position without finding an easy place. Chill occurs in the afternoon at 3 p.m. and is accompanied by thirst (not before). Chill followed by burning heat all over. A general feeling of oppression in chest. Thirst is absent during fever and perspiration. During fever and sweat stage patient breaks out in profuse urticaria. It is especially useful in chronic intermittent fever, especially contracted in low marshy lands. Complaints appear with great regularity at precisely the same hour every day, every other day, every week. Chill long lasting, often twenty-four hours. Patient complaints of chilliness, as if the bones are made of ice. Chill with great thirst yet drinking causes shuddering. Chill commences in the back. Heat and sweat coincide, instead of following one another. Face alternately pale and red. Heat and sweat without thirst. It is useful when the case is spoilt by quinine. Hands and feet icy cold and wet with cold sweat. Redness of one cheek and paleness of other. Heat with thirst or thirstlessness. Nausea and vomiting, dry hacking cough. It is useful in intermittent fever after the abuse of quinine. Chill without thirst, at 4 p.m.
Vomiting of mucus when chill commences on. Thirst before and after chill, not during chill. There may be thirst during fever. There may be moaning or lachrymation during the heat stage. Sometimes one hand is hot and the other cold. Sweat one side. General or partial sweat at the end of fever.